Kitchen cabinets serve as the focal point in this busy room in your home. So when your cabinets are scratched and faded, come to us to revitalize this space. We have an assortment of quality brand-name cabinets that are as attractive as they are durable. Come into our showroom to see the features that help you organize the space. These include pullout trash bins, glassware racks, and divided drawers, to name a few. Let us show you how we can customize your cabinets to meet your unique needs. Space is at a premium in any bathroom. You have so many items competing for space, from the fixtures, such as showers, tubs, sinks, and toilets, to items that are useful in this room. This includes grooming products and accessories, cleaning products, paper products, and towels. This all need to fit into this limited space. An abundance of cabinets is the answer. We offer a wide range of storage solutions in a variety of styles, colors, and sizes. It is our goal to give you the storage you need so everything has its proper place. This is the best way to avoid a messy space. This is a room where we help you combine beauty and practicality. One of the best ways to do this is with the use of bathroom vanities. Make counter and storage space around the sink with a handsome vanity that complements the décor of the room. We have an assortment of vanities for you to make your selection. Our professionals work with you throughout the process of remodeling your kitchen or bathroom with new cabinets. We provide sales, design, and professional cabinet installation. Ask us to schedule a convenient day and time for installation and we send a team of skilled and knowledgeable professionals to do the job. This ensures you’re your cabinets are level and secure so you receive many useful years of service from them. 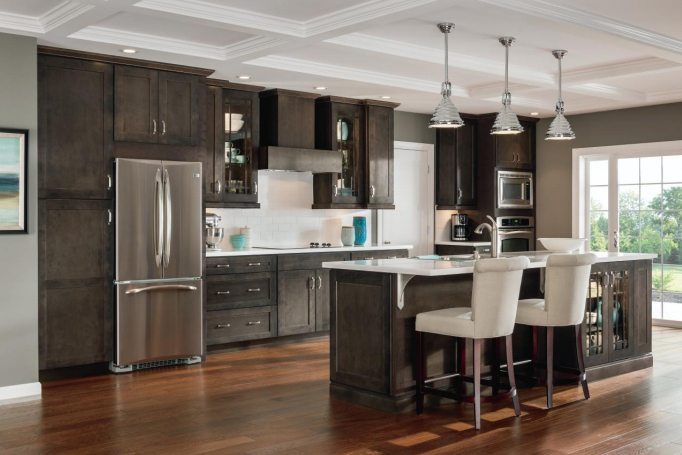 Contact us now for your free in-home estimate on new cabinets for the kitchen or bathroom. We proudly serve the communities of Carroll, Denison, Jefferson, Harlan, and Lake View, Iowa, as well as the surrounding areas.